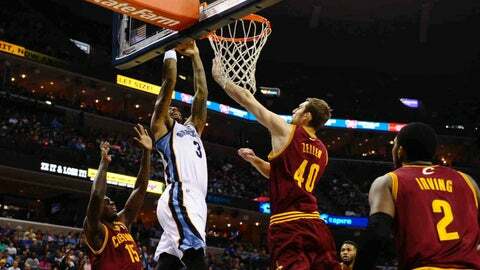 Mar 1, 2014; Memphis, TN, USA; Memphis Grizzlies power forward James Johnson (3) dunks the ball against Cleveland Cavaliers center Tyler Zeller (40) during the game at FedExForum. — That wasn’t so bad. I know, every loss hurts, especially when you’re the Cavs and fighting for your postseason lives. But I wrote in my pregame bullets the Cavs would probably lose, and I’m writing in my post-game bullets there’s no major shame in having done so. — It was the Cavs’ fourth game in five nights (Amico Excuse No. 1), it was on the road against a quality team (Amico Excuse No. 2), and the Cavs were still without the injured Anderson Varejao, Dion Waiters and C.J. Miles (Amico Excuse No. 3). Three Amico strikes, and the Cavs are out. — The Cavs raced to 65 points in the first half, then plodded to 31 in the second. Normally, I’d complain under these circumstances, but having covered the NBA for so long, I totally get it. Overall, the Cavs have played much better in their previous 12 games (8-4) and overall, they look like a team with talent and something close to a winning culture. I think that’s what most fans have been waiting for. — What the Cavs are not, however, is consistent. They often have trouble sustaining what’s working throughout the course of the game. Recently, I think that’s mostly because of the injuries. Nothing personal, but it’s tough to really go places when Jarrett Jack and Matthew Dellavedova are the only guys next to Kyrie Irving in the backcourt. — Regardless, I loved how the Cavs (24-37) played in the first half. LOVED it. They pushed the ball and the first open guy looked to shoot. Dribbling was kept to an absolute minimum. Push the pace, pass the ball and fire it up. That’s basketball. What is NOT basketball is standing at the top of the key, pounding the ball mercilessly, then driving into a double team and throwing up garbage. — I was totally in coach Mike Brown’s corner when he got here (the second time). Then I sort of turned on him when I saw the Cavs’ offensive woes and how miserable they looked in losing eight of nine. But if they can continue to orchestrate an offense similar to what they ran in the first half vs. the Grizzlies (as well as almost all game Wednesday at the Thunder), I’ll be the first to admit: Brown may be on to something. — Obviously, credit must be given to newcomer Spencer Hawes (13 points). He’s a 7-footer who hits perimeter shots and really understands how to pass. He can roll to the basket off a pick, or step out and bury the opponent from afar. And if you cut to the basket, he’ll almost always get you the ball. — Not having Varejao really hurt in this one. Grizzlies forward Zach Randolph (23 points, 14 rebounds) and center Marc Gasol (22 points) were just too big, too physical for Hawes, Tyler Zeller and Tristan Thompson. They’re too physical for Varejao, too, but he has a way of irritating guys with his hustle. — Thompson (18 points, 8-of-10 shooting, eight boards) put forth another fine effort, and Zeller wasn’t too bad off the bench, either. But those guys are pretty doggone young, and the 32-year old Randolph is strong and crafty near the basket. As someone mentioned to me on Twitter, Randolph is the idol of every 50-year old who still thinks he can be good. — Along with Varejao, both Waiters and Miles can’t get back soon enough. The Cavs need some real scoring threats in the backcourt. Besides Irving (28 points on 11-of-18 shooting), that is. Dellavedova always plays hard, but neither he nor Jack frightens anyone with his offense. — In fact, I’m starting to think the only thing Jack frightens anymore is the Cavs. I know he has the occasional good game (like maybe one a month), and can make a smart play here and there (like maybe three a game), but overall, he’s just way out of sorts. He dribbles too much, makes questionable passes and if you’re looking for someone who gets lost on defensive rotations, he’s normally your guy. The Cavs brought him here to play with composure and lead. It’s past time for him to pull it together. — I can also tell you that Luol Deng is driving me nuts. I can live with him shooting 5-of-14 and throwing up an airballed 3-pointer (both happened Saturday). But his lousy demeanor needs to end. Deng too often mopes and just acts like he doesn’t want to be here. Well, guess what? You’re here. Man up and make the best of it. You’re still under contract. Honor it by leading and behaving like a winner, even when the shots aren’t falling. — OK, that’s enough for now. I like what I’m seeing lately, even in defeat. I especially love how Kyrie is Kyrie again. But the Cavs’ have to dig deep, because that awful stretch is really costing them right now. They need to find a way, any way, to overcome it. So hang on, folks. The biggest challenge awaits.